This wool Topper’s outer layer is made from 100% Organic Cotton fabric. A White Lotus Home topper is made to lie under your fitted sheet, it can be used on top of any mattress and to replace a pillow top. This comfy addition to your nest is 1 1/2 inch thick made up of 3 layers of fluffy wool inside a 100% cotton case. It is also available in double the thickness. Wonderfully easy to air out and better than a feather bed any day…or night! 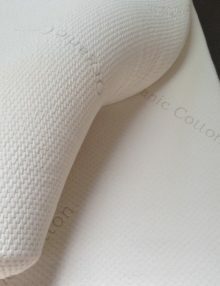 Wool is a natural temperature regulator fiber with the ability to wick away moisture from the body and especially the head, where large quantities of moisture are produced, even when you are asleep. Wool is a wonderful insulator, keeping you cool in the summer and warm in the winter without overheating. Another great property of wool is that it is naturally resistant to fire, mold, mildew, and dust mites. Because of all their amazing properties, we believe wool pillows to be far superior to down or any synthetic fiber.